Fast changing rules are making compliance a tricky proposition, and India’s micro, small and medium businesses (MSMEs) are hard pressed to stay on the right side of the law. New Delhi-based Busy Infotech Pvt Ltd, whose ‘Busy’ business management software has seen over three lakh installations worldwide, is claiming to the saviour of traders and small businessmen as they grapple with the Goods & Services Tax (GST). 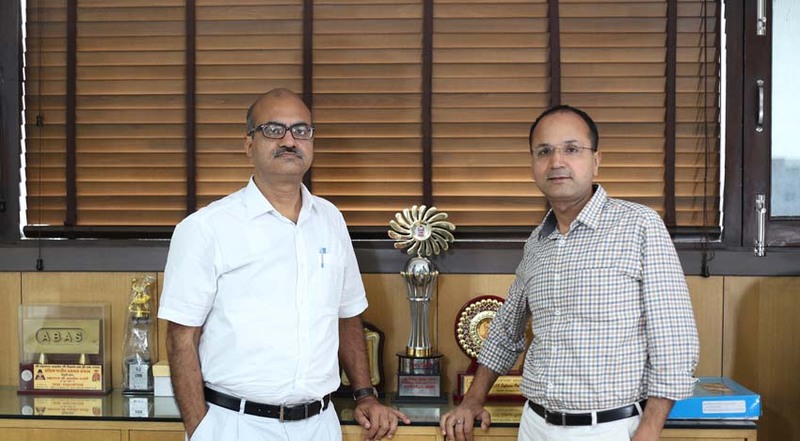 We sat down with Busy’s managing director Dinesh Kumar Gupta (Left in Photo) and director Rajesh Gupta to learn how they are trying to help their customers adhere in a heightened must-comply environment that has been triggered by GST. Is there a growing pressure on Indian businessmen to comply with new rules and laws? What role has business software to play in the increasingly complex business environment? Compliance has indeed become complex. Now it is almost next to impossible for traders and businessmen to perform compliance-related works manually. In our assessment, business software is no longer a luxury but has become a necessity. When we started our business in the early 90s, enterprises had to comply with sales tax rules. It was a low compliance environment in the country then. When VAT was introduced, the compliance got heightened and it provided a boost for the growth of accounting software companies. After the rollout of GST, compliance has become the order of the day for traders and businessmen. The new tax system is occupying much of their time, leaving little for conducting business. Even after one year, many people still get stuck with situations that arise due to GST procedures. An ordinary trader cannot manage GST. Most of them are unable to do things by themselves and are depended on consultants. They just cannot understand the intricacies of the process. So how does business software, Busy in particular, help in navigating the complexities of GST? The role of software is to absorb these complexities and offer a simple interface to the users. Good software should detect the mistakes right at the data entry stage when most mistakes happen. Data entry is the most important part of GST filing. During data entry, mistakes happen and people are unable to detect them. As a result, when they file a GST return, it gets rejected. In the past one year, we have noticed that this is the single biggest problem they face. Only good accounting software can save them from making such mistakes. When data is entered, it should be validated and ensured that it is GST complaint so that filing is not rejected. When a transaction or sale or purchase takes place, we have to key in the GSTIN (Goods and Services Tax Identification Number) of the party, which is a 15-digit code where the characters ‘I’ and ‘one’ and ‘O’ and ‘zero’ appear to be the same. If a trader is inputting 1,000 or 2,000 entries into his data, there are great chances of mistakes. People often communicate their GSTIN over the telephone, which may not be heard loud and clear. For instance ‘L’ could be heard as ‘N’. And if their file is rejected, they will not know the reason as the system does not show where the mistake really is. Busy automatically validates the GSTIN in the background. So, users can correct mistakes right during data entry and enjoy a hassle-free filing. What is the profile of your customers? We cater to small and medium businesses (SMBs) that have turnovers ranging from Rs 5 crore to Rs 500 crore. But, 90% of our user base comprises of enterprises with turnovers of Rs 5 crore to Rs 50 crore. We also have products for new businesses that have no turnover. How can MSMEs become compliant? Everyone should focus on understanding GST. Traders and businessmen should not rely overly on consultants. They should make themselves and their accountants acquainted with GST as consultants will not be present during every transaction. Next, they should install a good accounting software. This will make their lives simple. How is Busy positioned vis-à-vis other software in the market? Our leadership is in compliance. When we launched Busy in 1994, Tally was omnipresent in the market. We got our breakthrough because of our strength in compliance. Along with accounting, we had also incorporated sales tax into our software. Later, we also provided solutions for excise, service tax, TDS, VAT and now GST. We are front-runners in compliance. Pure accounting software are usually designed keeping accountants in mind. They assume that the person who is using the software knows accounting. Our product has been designed keeping businessmen in mind, assuming that he or she does not know accounting. There are many operations not connected with accounting, but still important to the business. That is why we have positioned Busy as a business management software. Our focus is on the operations that businessmen undertake throughout the day. What innovations are you planning to introduce in Busy? We will soon launch a new feature for GST reconciliation, which will enable a buyer to check if his supplier has filed his return correctly or not. Another soon-to-be-launched feature is a super fast e-way bill generation process. Usually, it takes 10-15 minutes to process an e-way bill. Just think how much time it will take to process a large number of bills? With the new feature, which will be available in the Busy 18 version, users will be able to do it in just a few clicks.